I’m taking this week off to relax, hang with family and work on something completely different. I’ve resigned myself to not getting all three theme forces done (Clash of the Titans) by Templecon, so I’m going to finish off the Skorne force, as well as this side project. If I get the Cryx done, it’s a bonus. On a not very well related note, the voting for the Paint It Pink painting competition has finally come in. The pink Butcher Army took Best Privateer Press Army, as well as Best Army. As a result of the army’s success in the competition, it will be going up for auction. I’m not sure where or how, or what specific charity the funds will go to. As soon as those details are ironed out you can be sure I’ll posting about them. Anyways, that’s all I have for you! Perhaps you’re like me, and swore you’d never buy those expensive resin bases that everyone seems infatuated with. The models come with bases – all you have to do is put in some time to make them. So, why spend money on bases, when you could easily spend that money on actual models? Because, boy-oh-boy, are these fantastic. Not only are they nicely detailed, they’re cleaner and better than anything I could make on my own. What’s better: they’re consistent. 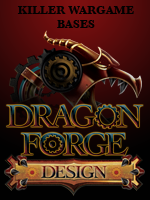 The bases carry a nice theme, and they do it across all the base sizes. The Goth Tech bases are great for steampunkery. They have old coblestone streets, as well as techy grates and cables. They’re well within the future victorian / dystopian realm. The Broken Wasteland bases are perfect for Protectorate of Menoth. They clearly resemble a arid, cracked desert, perfect for the hot-blooded zealots. I chose the Forgotten Empires for my Angry Elves because they clearly have that ancient temple ruins feel to them, which fits the background of the elves. Plus, some of the elf models I’ve gotten in trades already had the bases, so I figured I should just continue the theme. I’m looking at the Broken Wasteland bases, and not only are the cracked bits very random and scattered, but they have little scratches and dents in them, giving them texture and life. Likewise the Forgotten Empires bases have a rough texture on the stone parts, which will help retain the rough stone look when drybrushed. The cobblestones on the Goth Tech bases have the same dents and scratches that the Desert Wasteland ones do. These bases are solid! The bottoms are incredibly smooth, so there’s no work required to get the base to sit flat on the table. There are no bubbles to ruin the look of the bases and there’s next to no flash. They also arrived packaged in these awesome baggies, easily segregating the separate components of my order, which tells me Jeff (the guy behind the scenes) has his act together, and is organized. A fine product is dandy, but what’s the real benefit? Speed. I was able to paint one of these bases up in about 10 minutes, and easily pinned a warjack to it. In 10 minutes of work, I have a completely finished base that looks better than anything I could have done on my own. I’m not like Mugu, I can’t whip up fancy bases – and even if I could, I doubt I’d have the time to do so. For me, these guys are going to really help me paint models faster, and get more painted models on the tabletop. I really should have started using these sooner! I certainly don’t claim to be a tactical genius, but I usually make my opponents at least work for their win. The more I’m playing games, the more I’m reading about what makes a good list and what elements you need to be sure to include. I’m not talking about auto-includes, I’m talking about making sure your army is well rounded enough to handle most of the stuff you could see across the board while remaining synergistic and goal oriented. Of course, now that I have an Android phone (thanks Mom & Dad!) and access to iBodger, I’ve started taking a tougher and more thorough look at what lists I can field. Every model in your army should have a clear purpose. Whether it’s infantry clearing, handling hardened targets, harassing flanks or supporting another model, you the player should have in your head a very clear role for each model in your list. Otherwise, what is it doing on the table? Sure, all the models look pretty, but when you’re playing to win, you want to be sure everything on your side is helping you do that. That's a Euro AC outlet plug on an ethernet cable. Fun! Don’t use lists you find online. When you try to play an army someone else has put together, you’re doing double the work, and often get bad results. You won’t know precisely why they chose each model in their list – what each model’s purpose was. You need to determine that. I’m not saying don’t every try a ‘net list, but take them all with a grain of salt. Learn why they chose a particular model or unit, and try out that unit in a similar role. Take the list’s ideas and implement them in your own way. Whenever I’m thinking up a list, there are several questions floating around getting caught in the cobwebs of my head. Before I’m satisfied with a list all of them need to have answers. They don’t have to be good answers, but so long as they’ve all been addressed, I’m OK going into battle commanding the force. Sometimes, the faction itself offers many solutions to these questions. Legion, for instance, has Eyeless Sight, which handles Stealth, and most Legion beasts have Pathfinder or flight and thus ignore terrain. Other times, one question is huge while another nearly drops off the radar. An example of this is when I’m pondering Khador – they’re slow so Rough Terrain is a huge problem. However, their warjacks all hit so hard, that I really don’t tend to care about enemy armor. Every faction has access to something that answers those questions. Not all of those answers reside on a model’s card. Going back to Khador, often my answer to rough terrain is deployment. I’ll try to opt to go second, and I’ll deploy such that I don’t have to maneuver much to hit the enemy lines. Another example might be how my Butcher1 T4 force handles Stealth. (LOL) Since it has next to no ranged weapons, but is incredibly fast, I simply don’t let Stealth affect the game much. Even if your answer is “I can’t do anything about X.”, then at least you go into the battle knowing. If you can’t handle Stealth, you can maybe position your models so the Stealth models spend most of the game trying to get into combat. Or, if you can’t handle rough terrain, perhaps you turtle up and make the enemy come to you. Having a counter to tough models is one thing, but you can’t be all defense. You have to think offensively also. The models you take with you to a battle have to act together and become that clichéd “whole greater than the sum of the parts”. This is where support models come into play. Beast Handlers, Whelps, a Choir or Vassal, they don’t do much of anything to help you answer the questions above, but they sure make your opponent have to answer them. Sometimes, a good offense is a perfectly valid answer to those defensive questions. Take a Morghoul1 army for example. By turn 3, you should have applied a Titan liberally to the enemy caster’s face. If you’re so fast, or so brutal that you can keep the enemy on their heels and off balance, then their strengths won’t have time to find your weaknesses. High Armor? The Carnivean hits like a freight train, and the Ravagore has enough oomph to finish off anything the Carnivean has trouble with. So long as I deploy them far enough apart and staggered (front to back), they should be free to help eachother as needed. Also, the Strider’s can CRA for one massive shot, or single shot and whittle down something with 1-2 damage per shot. High Defense? Lylyth’s feat gives all friendly models an additional die on attack rolls. So when beasts boost to hit, they;re rolling 4 dice. They army shouldn’t have a problem hitting things. Stealth? Uh, it’s Legion. The few models that don’t have Eyeless Sight are pretty fast, and have either Light Cav, or Reform, so I can close to shoot, then back out. Tough? This one’s a problem. I don’t have a bunch of models on the table, so I don’t have quantity of shots in my favor. Tough will put a damper on my killyness, so I’ll have to focus fire on a part of the army, wipe it out and then pick the next part. Or, go for the ‘caster kill early and keep the opponent on the defensive. Something to look out for. Incorporeal? Lylyth’s bow is magical, that’s about it. I could run a heavy or shredder nearby, shoot it with Lylyth, and then Eruption of Spines into the enemy model. 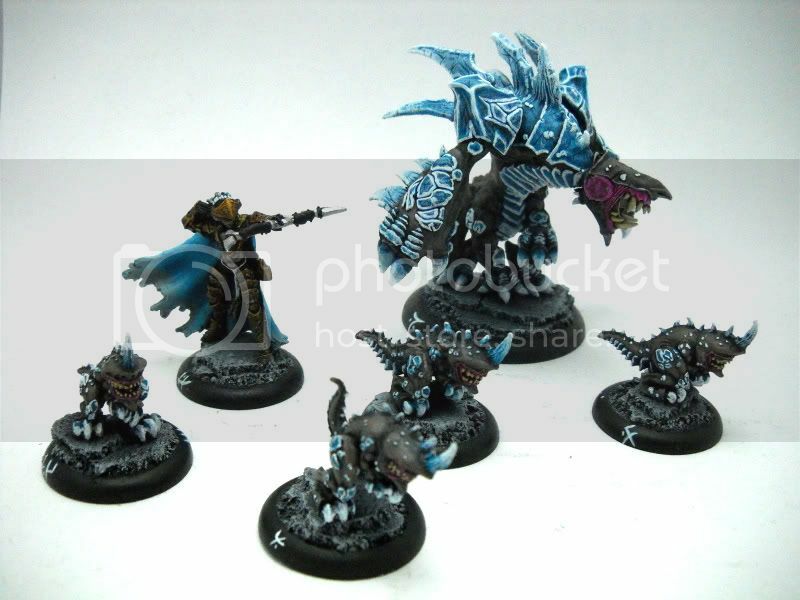 At 50 pts, I really want to add Hex Hunters + Bayal, so they would be a great counter for Incorp with their magical weapons and Hex Bolts. At 35pts though, another weakness to work around. Difficult Terrain? Again, being Legion helps here, since most models have Pathfinder. Even the Shredders get it when they go Rabid. Terrain will really help me with this army, it’s definitely an asset. Infantry? Carnivean’s spray, Ravagore’s AOE, Striders can shoot 8 targets, and Lylyth’s Eruption of Spines all help clear out infantry. ‘Jackwall? The Carnivean and Ravagore both have two open fists, they’re perfect for 2-handed throwing ‘jacks or beasts into the opposing warcaster who will be knocked down, about to eat Lylyth and Striders to the face. Synergy? IMO, Lylyth is a support caster. She helps her army do the work. The two shredders can easily tear apart a lightly armored or parasited target, and the Carnivean’s spray and Ravagore’s AOE love a parasited unit. The Striders can control an entire flank on their own – most people are scared of them because they have CRA, Stealth and Reform, so they hit hard and are hard to catch. The die to AOEs though. Anyssa is perfect for the opposite flank, harassing or picking off solos. If she’s lucky enough to get into the enemy’s backfield, she can easily pick off support models or even a caster if possible. With poison on her bow, she’s perfect for picking of anything that’s alive. The Shepherd helps me run the beasts hot, and mitigates Lylyth’s small 10″ Control Area. So how did the list fare through the theorymachine? Decently well. It’ll have a rough time against Trolls or other Tough armies, and it’ll suffer when going against large swathes of Incorporeal models, but otherwise it’s fairly solid. If this were one of my two lists in a tournament, I’d probably tailor my second one to handle tough and incorporeal, so when going against Cryx or Trolls, I’d be able to negate their unique abilities. What is your list building process? What list are you looking to try out soon? How could I improve my list building process? Cryx is my next army, and I wanted to start playing with colors and schemes. I’m drawing the majority of my inspiration from the Alternate Cryx scmeme in Superiority, which is a super dark green. The dark green exudes power, greed and vile but the heavy copper / brass grounds the model firmly in the bronze era, and steam punk. I’m going to use bone as an accent color, because it will really pop, much like the white and yellow on my Skorne. For the Bonejack, I started with Gnarls Green. I picked out all the major panels, but tried to leave some for the Bronze. I painted the bone head in … yep, bone. original eh? Menoth White Base does the trick, and a wash of Gryphonne Sepia makes it look old and dirty. I also used the Bone color on the toes, but they need another few coats before they’re solid over the black undercoat. The brightest parts of the bone are Menoth White Highlight. I couldn’t decide what to do with the Arcnode. At first it was bronze, but I didn’t like that much Bronze all in one big line, so I tried silver (Boltgun Metal). That just didn’t feel right, so I tried bone, and I like it. I like the idea that the Cryx, who re-use body parts, might use some bone from an ancient magical being as part of the Arcnode structure. Since I’m using green as a primary color, I can’t use green for the furnace. Cryx ‘jacks are supposed to use Necrotite, not coal, so a traditional red / orange-y glow is out. I went with a very light blue instead. I started with Frostbite, then a 50/50 mix of Frostbite and Trolblood Base, and the darkest bits are pure Trollblood Base. The brass is P3 Molten Bronze, washed with Ogryn Flesh and a smaller wash of Baal Red. I then highlight the edges with the Molten Bronze, and pick out corners with a little P3 Shining Gold. What do you think of the paint Scheme? What color do you suggest for green highlights? Last week, I played a game against local player Mark, who you may or may not remember from one of my first battle reports. He plays Cryx, and he plays dirty. Games with him are never boring, and are always bloody. I was trying out my 35pt Hexeris T3 list, and Mark concocted a list on the spot with only the knowledge that I was playing Skorne. As I build the lists on Forward Kommander, I think Mark was one point over, but I don’t think it had an effect, nor do I think 1 extra point at 35 would be a game changer. Along with trying out this Hexeris List, this was also the first game with my new terrain. I traded some models with Carl, a local guy who enjoys making terrain and helping out new players. He’s a fantastic guy, and this terrain he made is much more awesome than the felt cutouts I had been using. Mark won the roll-off, and chose to go first, effectively negating one of my tier bonuses, Advance Deploy Swordsmen. Another of my Tier bonuses was Upkeeps in play first turn. I had Soul Slave on my Razorwurm (turning it into an Arcnode). I put Death March (+2 MAT and Vengeance), on the unit of Swordsmen without the UA, my sacrificial lambs. Lastly, Hexy had Psychic Vampire up and running. Venethrax put Soul Harvester on the Blood Gorgers, so anything they kill would feed souls to Venethrax. Helldivers advanced and burrowed, and everything else ran. On my first, I went for the sucker punch. Hex upkept his three spells, and the Swordsmen and guardians ran. Hexy charged the Ancestral Guardian, in order to get up field further without sacrificing everything to run. I caught the first handful of Blood Gorgers in Hexy’s control area. Hexy feated, and started firing Soulfires into them via the Razorwurm Arcnode. The first Soulfire hit, and the Blood Gorger failed his tough check, so it turned around and smacked his friend, then died. His friend made his tough check, and that feat chain ended. Hexy fired off another Soulfire, and failed to kill the Blood Gorger. Tough is a huge rock to Hexy’s feat’s scissors. I should have waited to catch more of his models the following turn, but I had read up on this first turn blitz strategy and wanted to try it. I think it has merit, but I don’t think this was a good army to use it against. Mark advanced the Blood Gorgers into combat, being unable to charge over the linear obstacles. The killed all but one of the Death Marched Swordsmen. The Bile Thralls advanced, and a few were in range to spray the Wazorwurm, knocking about half it’s life off. Venethrax put up Lamentation, and then advanced far enough to catch Hexy in his control area. The Black Ogrun advanced and shot at Hakaar, but missed. The Necrotechs advanced behind the bulk of the army, and the Scrap Thralls ran along the flanks, one of them engaging the Razorwurm, nullifying the Arcnode. The lone Swordsman Vengeance moves and kills a Blood Gorger. Hah! Corrution doesn’t go out on the Razorwurm, due to Venethrax’s Caustic Presence, takes out last box on its body. Hexy is one fury short (because I didn’t leave myself enough on the board) and, only upkeeps Psychic Vampire, and has to pay 2 Fury to do it due to Lamentation. The unit of Swordsen with UA pop their mini-feat, which causes them to automatically do a single damage point. They eat several Blood Gorgers, paying them back for the other Swordsmen. One of the Beat Handlers charges a Scrap Thrall, killing it. What a hero! The Ancestral Guardian (who is on his last leg due to Hexeris’ Turn 1 charge) frees up Razorwurm by charging the Scrap Thrall engaging it. The Razorwurm then attacks a Blood Gorger, boosting damage to get 2 dice, and drags it under. Marketh circumvents Lamentation and puts Death March on Swordsmen with UA, knowing they’re going to get hit with the remaining Blood Gorgers. Hexy puts 3 Fury on the Agonizer, rather than pay double to cast something. The Agonizer and Hakaar then advance up field. Venethrax has 12 Focus this turn, due to all the kills the Soul Harvesting Blood Gorgers. He upkeeps his spells, and passes out most of his focus to his ‘jacks, avoiding Psychic Vampire. A Scrap Thrall charges, and then takes out the last two points of health on the Ancestral Guardian. Blood Gorgers walk forward, attack the Swordsmen and kill 3 of them. Corrupter shoots a Burster shot at the Agonizer, killing it and a nearby Beast Handler. A Helldiver attacks Hakaar, deals 6 damage, and misses the last 2 attacks. The other Helldiver attacks the Razorwurm, misses first attack, misses second attack, and then misses the third attack. The rolls were snakeyes, then 1,1,2, then the roll was low by 1. Lucky me! Gerlak kills some swordsman, then kills Hakaar, then kills another Swordsman, with nothing nearby to continue the whirlwind of death. A Scrap Thrall engages the heroic Beast Handler, and the Black Ogrun party advances. They then performed a Combined Ranged Attack on the Gladiator, dealing 7 damage and pulling it way off course. The melee followup attack deals another 6 damage. At this point, we were getting close on time, the store was due to close in about half an hour. I saw an opening, and took it. The Swordsmen’s Vengeance allows for it to move out of the way, and it attacks the Helldiver, doing not much. Marketh’s Soul Tap gets around Lamentation, and lets Hexy upkeep Psychic Vampire and Death March. The Swordsmen activate, again shuffling out of the way, and put some more damage on the Helldiver with a combo strike, as well as killing off a Blood Gorger. Hexy backs out of Venethrax’s control area, and casts Rush (+2 SPD and Pathfinder) onto the Cyclops Savage. The Beast Handlers enrage the Savage, and shuffle around a bit. The Cyclops charges Venethrax, and after moving but before attacking, casts its animus on itself (which I realize now was entirely redundant – it’s a latent ability.) It needs a 9 to hit Venethrax, and ends up having to boost. The auto-boosted charge attack deals 12 damage to Venethrax. The Cyclops takes a second swing, and misses. If I;d not made the mistake with the animus, it could have boosted the second attack, and possibly ended the game. The Gladiator, surrounded by Black Ogrun, throws the nearest one into a Helldiver, killing the Ogrun and dealing significant damage to the Helldiver also. I ended up forgetting to activate the Razorwurm, his brown paint scheme blending into the dirty linear Obstacles. Venethrax has 10 Focus this turn, and rips into the Cyclops Savage. In one hit, he deals 19 damage, which is sufficient to end the beast’s life. What’s worse, is all three Fury on it immediately get added to Venethrax’s Focus. he then heals himself for 6 of the 12 damage he received from the Savage, adding insult to injury. The Blood Gorgers attack the remaining Swordsmen, killing the UA, leaving a lone Praetorian, who valiantly passes his command check. A Scrap Thrall Charges the Gldiator, dealing 5 damage, and the explosion’s blast kills the Hero Beast Handler. The Black Ogrun CRA the now unengaged Gladiator, but fail to wound with snakeyes. Had they been successful, the Gladiator would have been drug out of Hexy’s control area, leaving him short on FURY the following round. Dirty Cryx! A Helldiver engages the Gladiator, and Gerlak charges a nearby Beast Handler. He kills it, then kills the next one in line, then kills Marketh and finally engages Hexeris. Gerlak’s first attack hits, deals 8 damage which Hexeris takes. The remaining Helldiver attacks the Razorwurm, killing it. The Bile Thralls advance, and two are in range to spray Hexeris. The need 12s to hit, and both miss. The Corruptor attacks the last remaining Praetorian, using a Distillation shot. It hits and kills the swordsman, healing Venethrax for a further 2 health, leaving him at nearly full. With the store closing time imminent and two models left to tackle the oncoming avalance of undead, Hexeris conceeds. Feating turn 1 was not a good idea. Tough is a fantastic counter to the feat, since the feat is entirely driven on deaths. I needed to wait, and catch the majority of the enemy army in Hexy’s control area, in order to make maximum use of the feat. I also could have used the swordsmen auto-point as a great feat chain starter. Having the Cyclops cast its animus on itself was a rookie mistake. Had that not happened, it would have had another FURY to use, and would probably have hit and dealt some damage. Ideally, the Gladiator would have made the assassination run, but the Black Ogrun completely side tracked it. All in all, Mark’s list was a good counter to mine (Soul Harvester completely robbed Marketh and the Guardians out of souls, which hurt), and while I got completely dominated, I saw just about everything this list can’t handle well. Hopefully, I got all my learning done early, and I’ll fare better during my next game. What would you like to see in future battle reports?